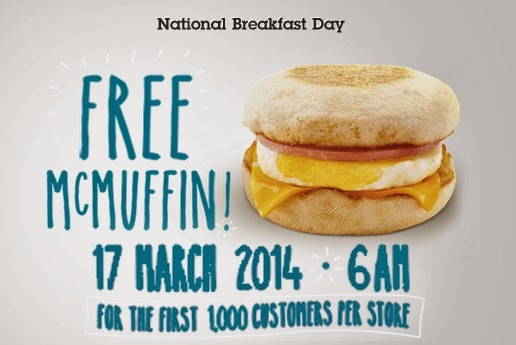 In celebration of National Breakfast Day, McDonald’s is giving away 1,000 McMuffins in each of its store on Monday, 17 March 2014. At 6am, McDonald’s will be serving free McMuffin to its loyal customers as a way of saying “thank you” to customers who makes it a habit to start their day at McDonald’s. In its second year, the Free McMuffin day will be on a first-come-first-serve basis and is valid for the first 1,000 customers for each stores. Check here for the list of participating McDonald’s branches. This entry was posted in announcement, free grub and tagged National Breakfast Day on 10.March.2014 by admin.